In the 1980's, a group of forward-thinking Lions ventured beyond the Lions' time-tested blindness programs to dream a new dream - a dream of creating a Mecca for blindness issues and vision care in the Rocky Mountain region. With vision and leadership, the Rocky Mountain Lions Eye Institute Foundation was born and the dream has become reality in the world-class Rocky Mountain Lions Eye Institute. Now, new dreams are being dreamed. The Rocky Mountain Lions Eye Institute, which opened in 2001, is located on the campus of the University of Colorado Health Sciences Center at Fitzsimons in Aurora, Colorado. The Eye Institute addresses a broad range of vision and sight problems and brings a unique opportunity for establishing national recognition through excellence in ophthalmic research, distinguished educational programs, and distinctive clinical care. 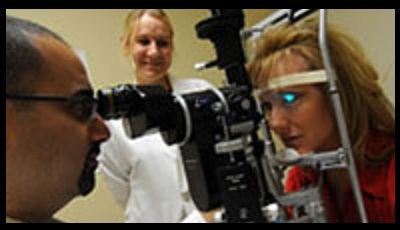 Building upon the triad of research, education, and service to the community, the Rocky Mountain Lions Eye Institute provides skilled services for those seeking care for eye diseases, facing unique or perplexing problems, or requiring secondary or tertiary opinions.